Good health is the ultimate luxury. The Daiwa Majesty massage chair gives you the royal treatment, offering whole-body wellness based on advanced engineering. The Majesty uses therapeutic features to deliver thorough full-body massage, heat, and zero-gravity therapies. The chair's gliding mechanism shifts its seat forward during the reclining process. This feature allows the entire chair to be placed just 3” from any wall, while other recliners require up to 20” of space. This space-saving design combines comfort with practicality. The Daiwa Majesty features an extra-long, L-Shaped Massage Track that runs from the top of the shoulders to the bottom of the hamstrings. Unlike most other luxury massage chairs, whose shorter massage track is limited to the bottom of the backrest, the Majesty offers a supreme full-body massage experience. With a simple adjustment, the massaging shoulder pads can accommodate larger arms and shoulders for maximum effect. 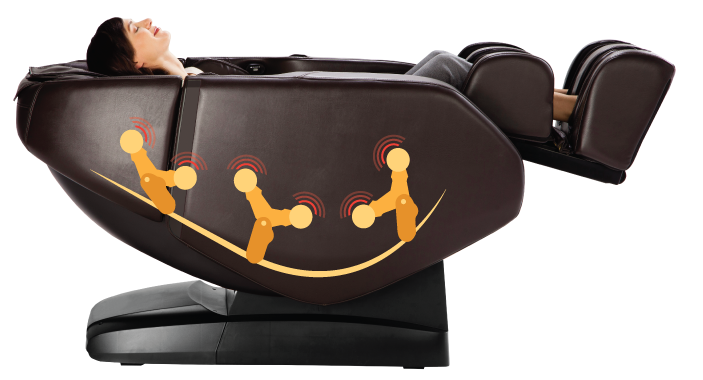 No other massage chair on the market offers this adjustment, which works by swiveling the pad up, allowing it to target the large muscles at the top of the arm. When inflated, they push firmly against the shoulder on either side. Built into the chair are 42 Airbags that rhythmically inflate and deflate during the massage session. These airbags gently stretch muscles to ease tension, improve circulation, and reduce body fatigue. Airbags are located on the shoulders, around the arms, and even under the thighs and calves to apply a full-body stretch. Feel pampered from head to toe! The Majesty features a manual leg extension. The footrest slides in and out, up to 5.5 inches, to ensure a comfortable experience for users of any height. The 3D Body Scanning System maps your entire back, adjusting the rollers for massage accuracy and efficiency. This system ensures a massage that is contoured to the unique curvature of your spine. The therapeutic heat function targets the lumbar region to ease tension, reduce stress, and alleviate sore muscles. The Zero-Gravity Experience shifts the seat to one of two positions, distributing body weight and reducing pressure throughout the body to achieve a floating sensation. Position 1 removes all stress on the muscles to achieve a weightless environment. Connect to compatible devices to play your favorite music. High quality compact speakers are mounted above the shoulder massagers and aim at your ears for a surround-sound experience. Keep your devices charged with Majesty's convenient USB charging port. Foot Pads are included to adjust the pressure of the foot rollers to your personal preference. Built-in ankle grips gently hold your ankles in place while powerful airbags swell and ebb to relieve tension and improve circulation.